The answer isn’t simple, which I why I’ve prepared this narrative as a companion to the simple work history presented in my resume. If you’re not interested in the whole story, the short answer is that my versatility has allowed me to hop between several career tracks in journalism. I’m an experienced editor and writer, a former page designer and an early adopter on the Web. I’m one of the few people to make the jump from print to Web, then back to print, then back to the Web, then halfway back to print. My experience is nothing if not diverse: covering high school basketball in rural North Carolina, designing the syndicated “That’s Racin'” NASCAR page, doing live election coverage in the early days of the Web, coordinating coverage of the Winter Olympics from Salt Lake City, researching a graduate thesis on new media, writing a soccer column that ensures an entertaining stream of e-mail to my inbox and jumping on the emerging sport of mixed martial arts. A rational mentor would have talked me into going to law school or graduate school, most likely in music. Fortunately, no such mentor existed. Though I had no professional experience and no journalism professors to recommend me for top jobs, I chased every newspaper lead I could find in the shaky economy of 1991. I landed on the copy desk of the Morning Star in Wilmington, North Carolina, where I did all the basic desk tasks: editing stories, writing headlines, designing pages and picking wire stories. Thanks to a hiring freeze, I wound up as a stopgap assistant city editor at the tender age of 22. After 18 months, I moved to the sports section. Desk work was still my main responsibility, but in a department of five, I had ample opportunity to write a column and the occasional game story. After three years in Wilmington, I was ready to move on to a newspaper I’d long admired, the News & Record in Greensboro. Here, I learned much more about page design, which gave me a chance to work in both the news and sports sections. Once again, I took on management duties, scheduling shifts for my co-workers and supervising the editorial assistants. By 1995, I had joined the ad hoc team that ran the newspaper’s first foray into the Internet. The next year, the paper put together a full-fledged Web site, and I was hired as coordinating producer. We were one of the fortunate newspaper site staffs given the freedom to do more than a simple rehashing of the print version. We took turns writing a column about the Internet for the paper, and we helped local groups and businesses develop their sites within our virtual community. I did live scene coverage under primitive circumstances, wandering around during an election or a golf tournament while making frequent trips back to the office or media tent, all using a state-of-the-art digital camera the size of a shoebox. Best of all, I put together original material to cover local sports teams with “Carolina” in their names: Panthers (NFL), Hurricanes (NHL), Dynamo (A-League soccer). Being in Greensboro also gave me the chance to commute each week to my alma mater, Duke, to work on a master’s degree in liberal studies. I broadened my education in a series of interdisciplinary courses in environmental studies, education, political science, history and sociology. I constantly sought to relate my classes to journalism and often wrote term papers combining my work interests and academic pursuits. In 1998, I was ready to move on. More importantly, I was engaged, and we were ready to move somewhere near Washington. My fiancee landed a job first, and I moved up with her to find a job. To my surprise, I ended up back in print, designing and editing a daily page of national and world news for Knight Ridder Tribune News Service (now McClatchy-Tribune). The page was canceled after six weeks, and I moved on to the weekly “That’s Racin'” page of auto racing news, along with other design projects and regular shifts on the news desk. 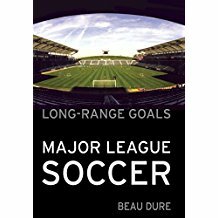 Here, I started a weekly column on Major League Soccer and wrote a few pieces on the Women’s World Cup in 1999. I also continued my graduate studies, doing an independent study on the history of objectivity in American journalism. All this, of course, was balanced with my wedding plans. When it was over, the sports department needed me more than the interactive department. I was asked to take over coverage of Olympic sports and soccer while also taking supervisory shifts and continuing to write my column. The exciting job of planning Olympic coverage, a crucial task for USA TODAY, grew more difficult as the economy went sour. The staff was reorganized one month before the Games, and golf was added to my plate. My immediate task was to keep our Salt Lake City coverage on track despite all the changes at the site. A couple of months later, I was responsible for our coverage of the World Cup, though I did not travel with the newspaper staff to Korea. More changes came in August 2002. I took over our hockey coverage and gave up golf. In 2004, I cut my hours to spend more time with my baby boy. My job for the first eight months was to build our coverage of the Athens Olympics. I worked with designers and programmers to get our site and the results feed in order. I also developed original content such as the Olympic Athlete of the Week awards, the 10.0 series of athlete interviews, brief bios on U.S. athletes and introductions to each sport. After the Olympics, I moved into a role developing projects and original content for all sports. For the better part of a year, I worked on an overhaul of our automated feeds, which segued neatly into development of the results feed for the Torino Olympics. I went to Torino to do live coverage by blog. I didn’t take a second trans-Atlantic trip for the World Cup, but I still blogged about the event. (Sadly, the archives for Torino and the World Cup were wiped out.) I spent the next 18 months focused on our new general sports blog, Sports Scope, while contributing features to USA TODAY’s soccer coverage. The sport that “emerged” was MMA, and it quickly became a big part of my job. My assignment was to follow the surging UFC and the other organizations trying to surge along with it. Soccer never left my desk, nor did Olympic sports. In 2008, I helped to get the online section running, then raced all over Beijing and surrounding cities to cover soccer and many other sports. The next 18 months were fantastic and fulfilling. I did legitimate multimedia journalism, adding video and audio to my work. In 2010, I was assigned to Whistler for the Winter Olympics, covering the Nordic sports and biathlon. But the job also ate into my family time. I had two kids. I had a lot of projects I wanted to do. It was time to leave. So after 10 years, 4 months and a few days, I left USA TODAY at the end of March 2010, having gained invaluable experience in soccer, MMA, Olympic sports, golf, hockey, high school sports, horse racing, XSL, automated stats, blogs, video, audio, Twitter, Flash and some other things I’ve probably blocked from my memory. The next year, I got the call to make another extended trip — this time to the Women’s World Cup in Germany, which I covered for espnW and ESPN. I kept up steady freelance work with ESPN through early 2012, covering the demise of Women’s Professional Soccer. 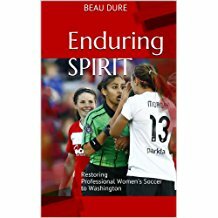 Since then, I’ve finished but not sold a book on MMA, written and self-published Enduring Spirit: Restoring Professional Women’s Soccer to Washington, written Single-Digit Soccer: Keeping Sanity in the Earliest Ages of the Beautiful Game, and written for outlets such as The Guardian, Four Four Two, Fox Soccer, OZY, Popdose and The Huffington Post. 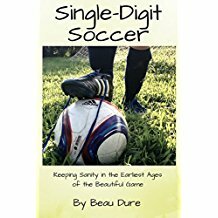 In 2017, having spent much of my recent time on youth soccer, I launched Ranting Soccer Dad as a podcast/blog.